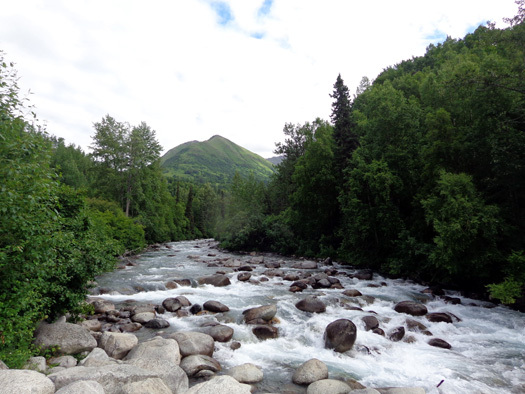 Hatcher Pass became known for its natural beauty and recreational opportunities." It was just too good to be true � another sunny morning when we got up! 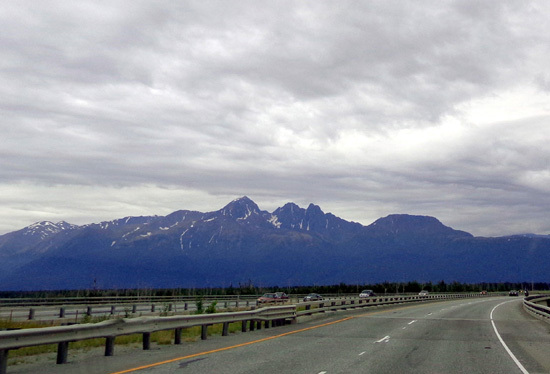 Alas, it was mostly cloudy in Anchorage by mid-afternoon when we got back from our drive up to Hatcher Pass and the Independence Mine and mostly overcast while we were up there in the Talkeetna Mountains. 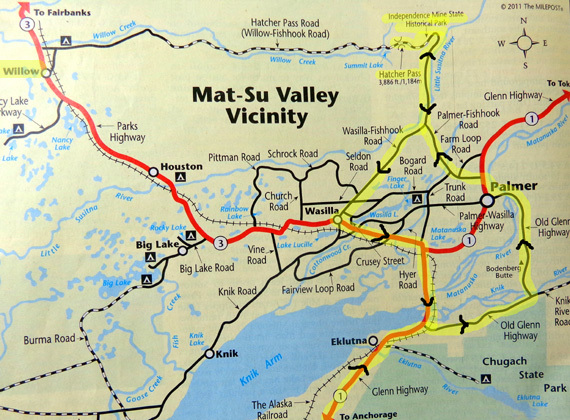 We still had a great day and highly recommend the day trip we did through and above the Matanuska-Susitna (Mat-Su) Valley. You'll enjoy it, too, if you like history and/or pretty mountain scenery. 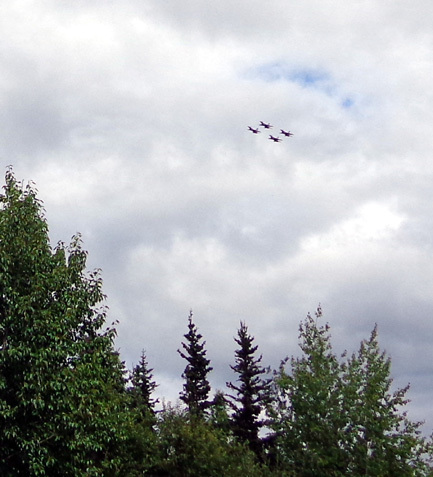 Last night when we went to bed (late, because of the London Olympics opening ceremony) Jim suggested not going to the Arctic Thunder air show today but waiting until tomorrow when there will probably be fewer people because the weather isn�t expected to be as nice. 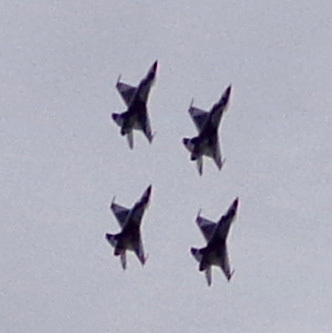 That was a good idea because there was quite a crowd at the air show today, per the local evening news, and gripes about how long folks had to wait to get in the gates. Since we weren't going to the air show today we decided to check off a couple items on my list of things to do in the area. 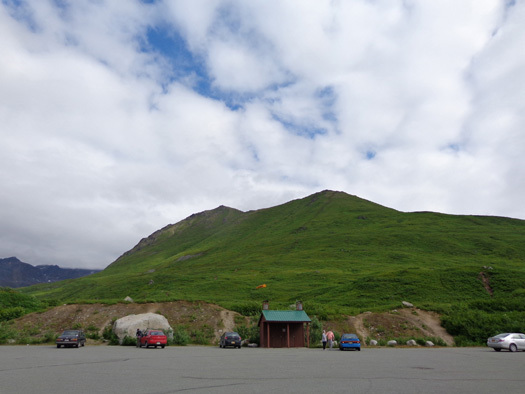 I�ve read only good reports in blogs and literature about touring the Independence Mine State Historical Site on Hatcher Pass Road so that was our activity of choice today. Old buildings have always fascinated me. So have old mines. I love to find abandoned mines and equipment in the Silverton and Leadville, Colorado area when we visit there and it's no different in Alaska. 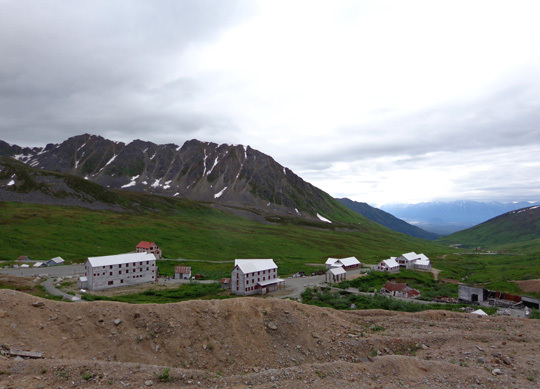 As soon as I read about Independence Mine in RVers' journals I knew I wanted to go there. I also wanted to see nearby Hatcher Pass because I love alpine scenery and views above treeline. I marked our route in yellow. 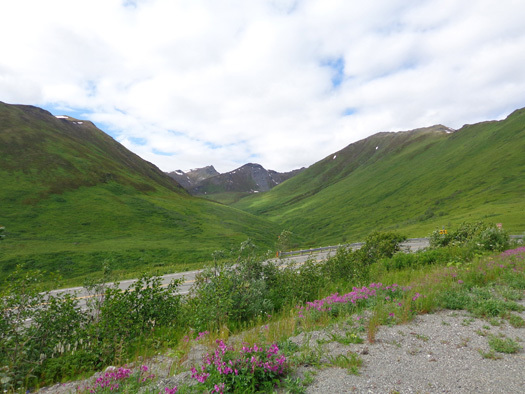 We turned around at the pass but Hatcher Pass Road continues west along the top of the map section to Willow. 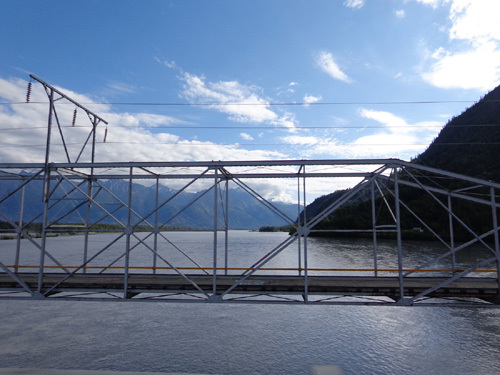 The road is paved for about 17 miles on the east side from Palmer and 10 miles on the west side from Willow. The paved segments are solid black lines; the middle unpaved section is a dotted line along Willow Creek. 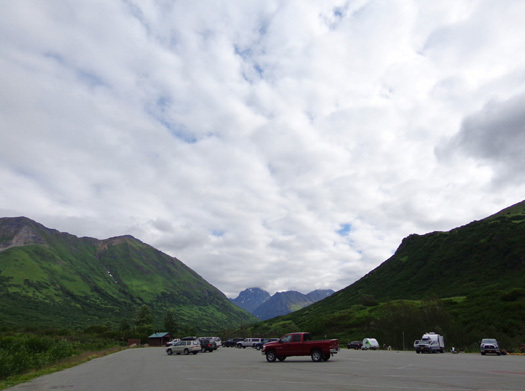 View from a parking area above the paved portion of Hatcher Pass Rd. Close to the pass the unpaved road is narrow, bumpy, and dusty. 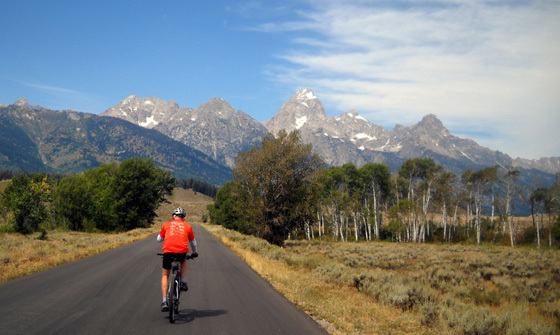 The middle 22 miles are reportedly steep, narrow, and very rough, with washboard surfaces, potholes, and rocks. The views are great if you have a vehicle suitable for that type of road. We don�t, so we stayed mostly on pavement today. 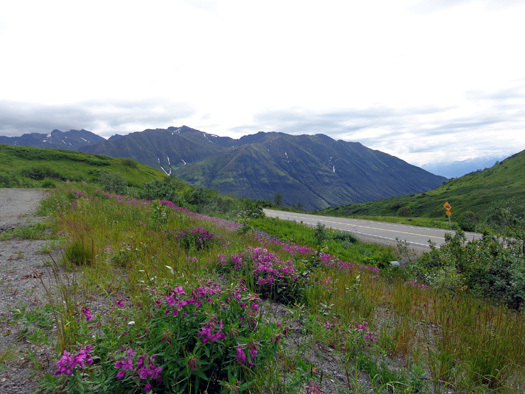 We left the Black Spruce campground at JBER about 10 AM and drove north on the Glenn Highway. 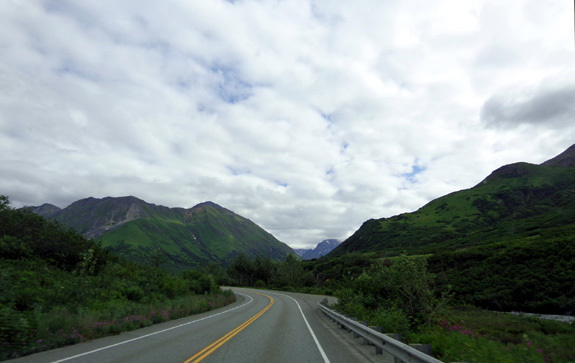 A few miles past the Eklutna exit we turned east on the Old Glenn Hwy. just to see some new scenery. 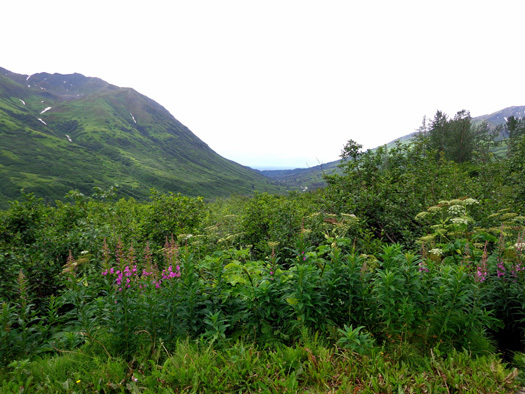 The northern edge of the Chugach Mountains rose up on our right and I was able to see Twin Peaks from the opposite side I saw when I hiked there the other day. 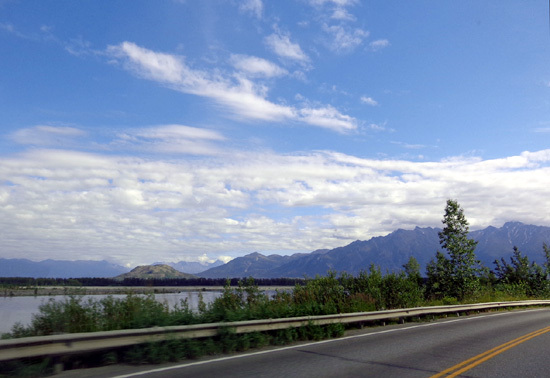 Crossing the Knik River on the Old Glenn Hwy. The road became more urban as we approached the town of Palmer. We turned east on the Glenn Hwy. 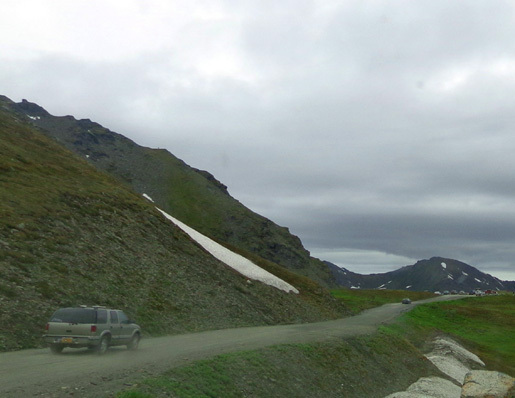 and drove to MM 49.5, the road to Hatcher Pass and the Independence Mine. The paved road was in good condition all 18 miles to the mine. We stopped several places on the way up to the mine. 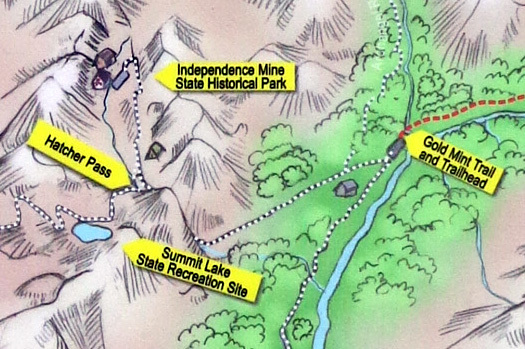 Several very informative interpretive panels provide information about the origin and power of the Little Su, the Castle Mountain earthquake fault we were standing on (! 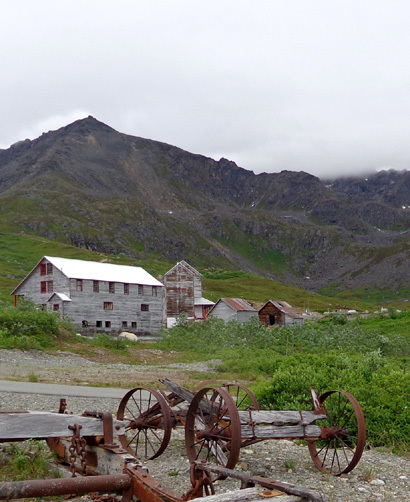 ), mining history in the Willow Creek Mining District (Hatcher Pass Rd. 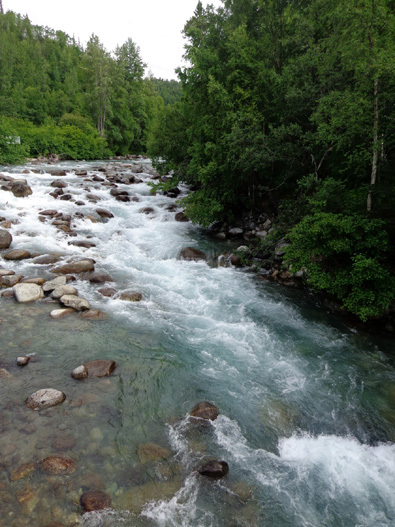 follows that creek most of its length), hiking and camping in the area, and the ecological zones we'd be passing through (mixed forest, sub-alpine, and alpine). 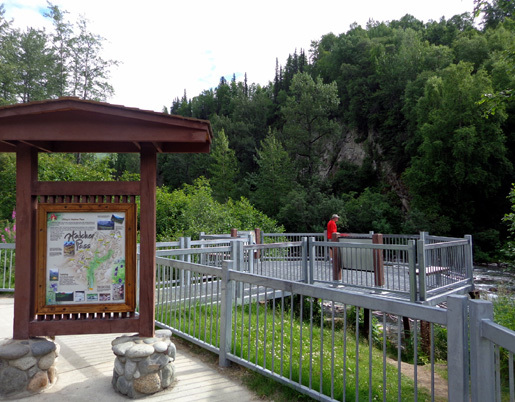 We also stopped briefly at the Gold Mint trailhead parking area (that�s a trail I�d like to hike, 8 miles to Mint Glacier, headwaters of the Little Su) . . .
We came to the mine before the pass so we turned off to see the mine first.